Even if you're not interested in resin (and I find it hard to believe that you're not! 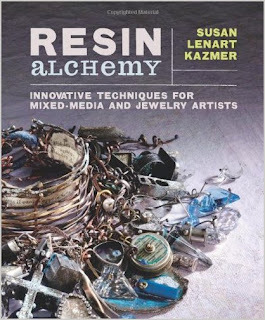 ), you'll want to read through Susan Lenart Kazmer's new Resin Alchemy for the way she explains creating pieces from the heart. When Susan's work first became well known to the beading world, many many people attempted to copy her free-flowing found object style, and she obliged us by teaching us the techniques. But copying another artist's work will never be as satisfying as creating your own, and that's really what Susan wants us to do if we're able. One of my very favorite parts of Resin Alchemy (and there are so many) is a little section where Susan gives us seven tips for choosing and combining objects in our own work. I love making mixed media pieces, but I always wander back to bead embroidery; now I feel inspired to discover even more ways to incorporate found objects into my pieces. Susan's language often speaks to me, even though I am not a fan of talismans, amulets, and other "powerful" items. The main point is telling stories, which you'll know I love since my first e-book is called Every Bead Has a Story! Throughout, Susan tells the story of many of her pieces, but even if she didn't spell out the details, you'd definitely get the right impression just from seeing them. And of course, this book is simply packed with details about how to use resin to create your own fabulous pieces in your own way: from the details of mixing and pouring resin, to using and creating bezels, into color, casting, collage and more. Published by Interweave Press, this book has their usual attention to detail all through it. There are eleven projects, but they are not the most important part of the book to me! They will help you master techniques, though, if you're shy about getting started. Dive in...the resin is waiting!